Authorities found 13 large black duffel bags containing a combined 450 bricks (537.6 kilograms) of cocaine aboard the MSC Desiree at the Port of Philadelphia on March 19, 2019. 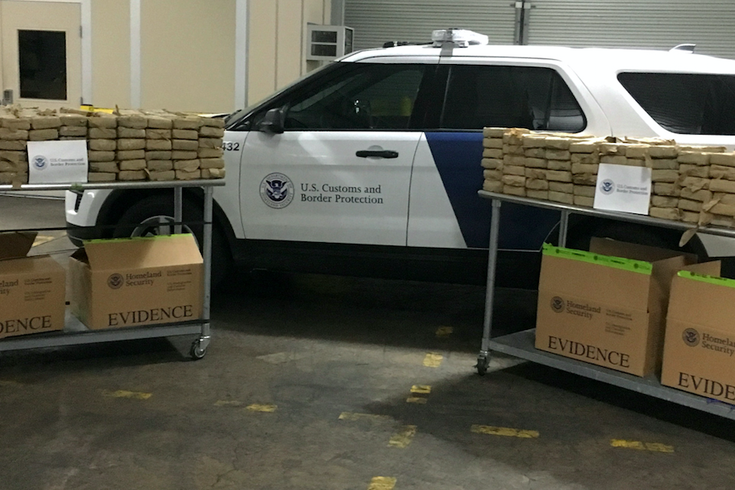 U.S. Customs & Border Protection agents joined Homeland Security officials for a Thursday morning press conference to announce the details of the massive cocaine bust at the Port of Philadelphia earlier this week. Reports of the narcotics seizure surfaced Tuesday afternoon as CBP agents conducted an investigation of a shipping container aboard the MSC Desiree, which had been on its way to Europe en route from Colombia. Inside one of the containers offloaded from the ship, officials said they found 13 black duffel bags containing a combined 450 bricks of a white powdery substance that has tested positive for cocaine. The total weight of the cocaine was more than 1,185 pounds, which has a street value of $38 million. That was even more coke than earlier reports, which has said agents seized 992 pounds, worth $18 million. Officials said Tuesday's bust was the fourth-largest ever at the Port of Philadelphia and the largest since a 1,945-pound haul of cocaine was seized in May 1998. In January 2018, federal authorities intercepted 709 pounds of coke entering the Port of Philadelphia. That had been the largest cocaine bust in Philadelphia since 2007, when officials seized 864 pounds concealed in a shipping container from the Dominican Republic. An investigation into the narcotics remains ongoing under the direction of Homeland Security Investigations.